Management shakeup at the top as stock prices slide. Following a board meeting this past Friday, the Ford Motor Company set in motion changes to senior management confirmed only this morning. CEO Mark Fields is out, Jim Hackett has taken his place, and three new roles for current Ford executives were announced. Also, long time Ford communications head Ray Day will retire in 2018 with Mark Truby replacing him. Hackett is the former CEO of Steelcase, a leading office furniture company. Besides modernizing Steelcase, Hackett served as the interim athletic director at the University of Michigan, bringing venerated football coach Jim Harbaugh to Ann Arbor. That move received praise from fans and has helped reinvigorate the program. 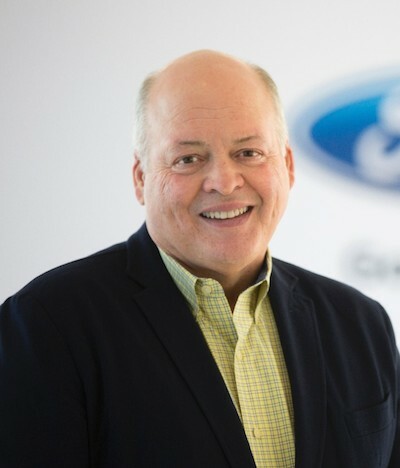 Hackett joined Ford’s board of directors in 2013, later named the chairman of the newly formed Ford Smart Mobility in March 2016. Bill Ford is a fan of Hackett and the two appeared together at a news conference this morning at Ford’s Dearborn headquarters to discuss the changes. These changes mean Mark Field has retired, following a distinguished 28-year career at Ford. Fields, now retired, succeeded Alan Mulally as the company’s president in CEO beginning in July 2014. Prior to that, he served as the company’s chief operating officer, executive vice president, and chairman of the automaker’s Premier Automotive Group. Early on he ran marketing and sales for Ford’s former Mazda subsidiary and also managed Ford’s Argentina operation. But Fields came in behind Mulally, who has been widely credited with saving Ford from bankruptcy. Unlike its chief US competitors GM and Chrysler, Ford had a large cash fund in place when the market nosedived in 2008. Essentially, Mulally hocked the house to create Ford’s war chest. That debt has since been paid off. Mulally also instituted the company’s “One Ford” policy, where the automaker began offering its products globally instead of regionally. Thus, the European Ford Focus came to the US market, while the Mustang sports car’s range extended to new markets, including Europe. Today, more than 100 markets offer the Ford Mustang. To his credit, Fields oversaw record profits and operating margins over the past few years. For instance, the company made a record $2.5 billion net profit in the first quarter of 2016 — more profit than any quarter in Ford’s now 114-year history. But profits are only one indicator of corporate success. Unfortunately, Ford’s stock price has fallen by 40 percent under Fields. At the most recent annual shareholder meeting earlier this month, shareholders pressed Fields and Chairman Bill Ford to explain why shares have plummeted. Further aggravating shareholders were the strong bonuses awarded to Fields and other executives as share prices tumbled. Clearly, shareholder disgruntlement and board angst led to the changes we learned about today. Besides Hackett stepping in, Ford announced three other personnel changes effective June 1. Firstly, Jim Farley is now the executive vice president and president of Global Markets, overseeing Ford’s business units in much of the world. In addition, Farley will oversee the Lincoln Motor Company along with global marketing sales and services. Secondly, Joe Hinrichs is appointed executive vice president and president of Global Operations. This means Hinrichs will oversee the company’s product development, manufacturing and labor affairs, quality, purchasing, and sustainability efforts, along with environmental and safety engineering. Thirdly, Marcy Klevorn is now the executive vice president and president of Ford Smart Mobility LLC, replacing Hackett. The subsidiary was formed to accelerate the company’s plans to design, build, grow and invest in emerging mobility service along with advancing changes to Information Technology and Global Data. 3), transforming the company to meet future challenges. Besides the immediate challenges of convincing Wall Street to boost Ford stock, the automaker must also face a tightening market. US sales are down year to date as analysts indicate peak sales were reached in 2017. Like its competitors, Ford must exercise discipline and avoid deep discounting, what can only hurt its bottom line.